In 1976 when Paddy Chayefsky’s film satire Network was created , it was already clear that television news was going down a dangerous road. Under the corrupted rule of corporate interests, determined to boost ratings at any expense, through any conceivable tactic, including the murder of a newscaster failing the ratings, Network prophesied Cable news as we know it today: partisan, packaged, sensational, performative, and completely manufactured. It is no wonder that the Daily Show, Stephen Colbert, Bill O’Reilly, et al rule the TV waves today. Howard Beale (Peter Finch) was the prototype Bill O’Reilly, Jon Stewart, Rachel Maddow, and Stephen Colbert all rolled into one entirely unhinged character. The difference here, is that in 1976 Howard Beale was moving into entirely new territory of self-indulged pundrity, yet through his excessive, subjective, angry, raving, truth-sayer antics, he defined what the medium was becoming. The era of Walter Cronkite and the notion of “trusted” information was on the wane, and was gradually being replaced with performance art that was inexorably linked to ratings and knee-jerk audience reaction. While Beale may have been the “real deal,” a true spokesman for the angry masses, he was immediately co-opted by the corporate brass, who saw in his mad utterances an opportunity to boost the ratings of their fictional UBS Network that was, to say the least, a real loser. Howard Beale was an immediate sensation, network savior, and angry prophet, driving viewers to the brink of hysteria, and the ratings sky rocketed. And so UBS because a reality tv circus show for re-enacted terrorism, religious tele-evangelism, and angry punditry on the brink of madness. In the end, Beale’s performances had to come to an end, ratings eventually plummeted, and the corporate execs knew exactly what to do: murdering him in front of a live television audience alongside the usual assortment of commercials, breakaways, and station identification. 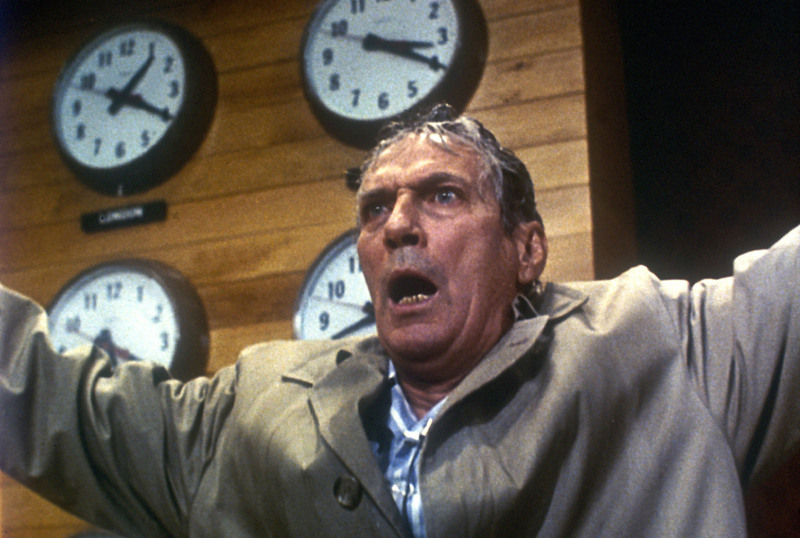 Network gloriously satirized the emerging era of manufactured news. The narrative of reporting would never be the same and in the post real environment of news media, where anything is possible, and everything is believable, and every opinionated voice has its moment in front of the camera. There is no longer any kind of disbelief that can’t be suspended when you’re mad as Hell and you can’t take it anymore.